Our service range includes a wide range of housekeeping, deep cleaning services, cleaning services, window cleaning and post construction cleaning service. 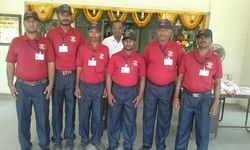 Versatile offers Housekeeping and Janitorial services that includes cleaning of the customer premises which features cleaning of table tops, window glasses, toilets, lobby and passages of the premises through out the day, vacuuming of carpet, removal and disposal of garbage, cleaning of back entrance, fire exists etc. We provide our trained staff for the client’s convenience and helps in setting up entire services for housekeeping purposes. • Bathroom Cleaning = Cleaning of tiles, faucets, sinks, taps, pots, shelves, cabinets, mirror - Disinfection of bathroom - Cleaning of washroom windows. • Basic Cupboard & Racks cleaning from outside. • kitchen Cleaning without stove and hob cleaning, degreasing not included. • Dusting and Mopping of the Mirrors and glasses. • Appliances and Upholstery cleaning like Sofa, Mattress, Carpet are NOT included. With the thorough knowledge of the varied aspects of the market, we have been able to render unparalleled Cleaning Services. Our services are widely used in residential and commercial sectors. All our services are rendered in strict compliance with the international quality standards using genuine raw material and advent tools. Besides, we render these services with the help of expert professionals, who possess in-depth knowledge and experience in this domain. We are service provider only in Maharashtra, Gujarat and Karnataka . 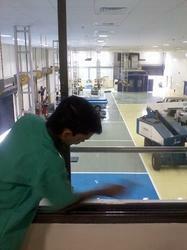 Our customers can avail Window Cleaning Services from us. The window cleaning services offered by us are rendered by hard working personnel, who are hired by us after stringent selection procedure. In addition to this, personnel hired by us ensure to provide the window cleaning services with respect to the diverse demands of honorable clients. After the completion of construction for a commercial or residential project, there is often a detailed post construction clean up required.We provide thorough, post-construction cleaning services to remove all the dust and debris and leave your premises sparkling. We use the most advanced products and methods to make your newly renovated or constructed property look its best. We employ highly trained staff to complete the post construction clean up quickly and even work nights to fit in tight schedules, effectively. An important part of after construction cleaning is debris removal. We remove junk and heavy debris such as wood, metal, drywall, old windows, old doors, trash, construction site waste and construction by-products. We bring a dump truck and necessary tools to safely remove all of the debris. At this stage of construction clean up, we also provide regular cleaning and maintenance program to keep your facility looking its best day after day, year after year. Looking for Housekeeping Cleaning Services ?